Winter weather can do quite a bit of damage to our homes, and especially to the roof. This can lead to many homeowners going back and forth on whether to install a new roof or not. Before you decide, though, consider three of the major benefits that come with a new roof. It’s no secret our roof protects us from the weather and other outside disturbances. After a while, though, it starts to break down, which can expose your home to water damage. That can lead to mold growing in places of your home you can’t see, such as the inside of your walls or your attic space. 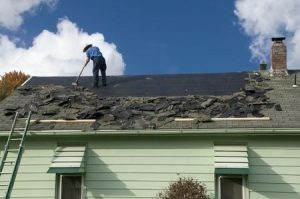 The water can also cause drywall to buckle and paint to peel off the walls, and in extreme instances cause rot in roofing structures, potentially leading to extensive damage. Getting a new roof will give you brand-new protection and go a long way in preventing all this from happening. If you hire Roofing by Bruce to install your new roof, we offer a long-term guarantee on workmanship in addition to the product warranties offered by the manufacturer. Depending on the specific product and maker, this warranty could be a few years or even a lifetime. Backed by our dedication to performing only high-quality work, you can rest easy in knowing that if there is a problem with materials or with the integrity of the performed work, you’re protected from having to make costly repairs or remediations with your warranties and our guarantee. Roofing by Bruce can also set up a regular maintenance plan to maintain your roofing after it’s installed. This means our team can come out and check for things such as leaks, damage or soft spots on the roof as part of an annual maintenance, and even perform a roof and gutter cleaning to remove leaves, dust, dirt and grime. Properly maintaining your roof will help extend its life and ultimately save you more money in the long run. Roofing by Bruce offers new roofing installation, roofing repairs and inspections for homes and businesses throughout the Pennsylvania Poconos from their base in East Stroudsburg. To learn more about our roofing services or to set up an appointment, call us today at 570-424-7250.